The Mersey Railway connected Liverpool and Birkenhead, England, via the Mersey Railway Tunnel under the River Mersey. Opened in 1886, the railway contained the first tunnel built under the river. It was constructed by John Waddell, who had been sub-contracted the work by Samuel Isaac. The Mersey Tunnel was designed by Sir Charles Fox, and the design was carried out by his son, Douglas Fox, a Civil Engineer who was joint engineer to the Mersey Tunnel Co (set up in 1866) with James Brunlees. Douglas Fox was later knighted for his work on the project after its official opening by the Prince of Wales, later King Edward VII. The Mersey Railway opened between Green Lane station in Birkenhead and James Street station in Liverpool in 1886, via Birkenhead Central and Hamilton Square stations, both in Birkenhead. In 1888 a branch to Birkenhead Park station opened, with a connection to the Wirral Railway. This was followed in 1891 by an extension from Green Lane to Rock Ferry with a connection to the Birkenhead Railway. 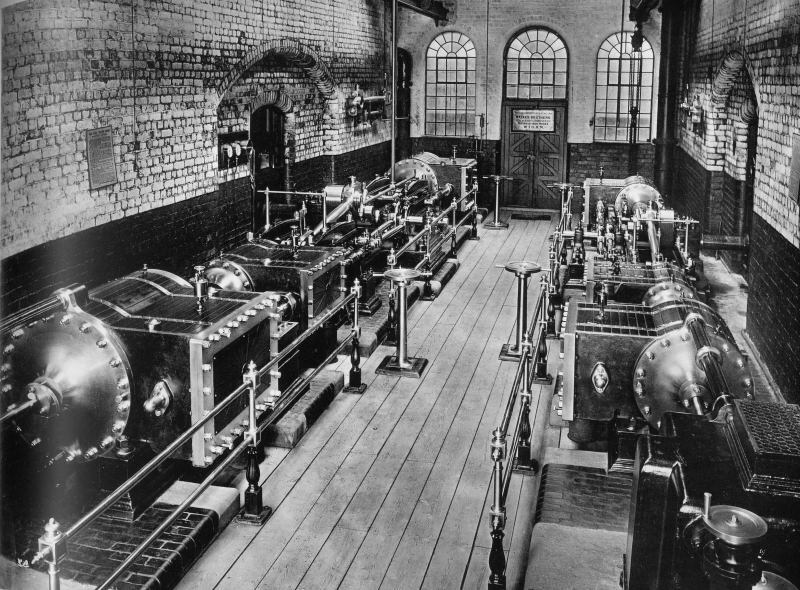 The whole of the ventilating system was supplied by Walker Brothers, comprising five fans with the steam engines for driving them. Four were Walker's improved Guibal type, and one was the Walker 'Indestructible' type, erected near Liverpool Central Station . See photo. In 1892 the tunnel was extended from James Street to a new Low Level station at Liverpool Central. The total length of the tunnel was 3.12 miles and by 1890 it was carrying 10 million passengers a year. For the opening of the line, eight powerful 0-6-4 tank locomotives were obtained from Beyer, Peacock and Co. These were fitted with condensing apparatus for working in the tunnel. One of them (number 5 Cecil Raikes) is preserved at the Museum of Liverpool. It is likely that it is named after Henry Cecil Raikes who was Member of Parliament for Preston in 1882. Beyer Peacock built a ninth 0-6-4T locomotive in 1886, along with six 2-6-2 tank locomotives in 1887–1888. A seventh 2-6-2T was built by Kitson & Co in 1892. After electrification four of the Railway's 0-6-4T locomotives were sold to J. & A. Brown of New South Wales, Australia, where one, number 5, former Mersey Railway number 1 The Major, is preserved at the New South Wales Rail Transport Museum, Thirlmere, New South Wales. Three other 0-6-4T (nos. 2, 3 & 6) and all seven 2-6-2T locomotives (nos. 10-16) were sold to the Alexandra (Newport and South Wales) Docks and Railway between November 1903 and January 1905, becoming their nos. 6-11 and 22-25. All ten passed to the Great Western Railway in January 1922, and were withdrawn between January 1923 and May 1932. In 1903, the railway was electrified, becoming the first underground railway in the world to change over completely from steam to electric power. It was originally electrified with a fourth rail system, which was later replaced by a third rail system. The nearby Liverpool Overhead Railway, the world's first electric overhead railway, had already operated successfully with electric traction since its opening in 1893. The Mersey Railway electric trains ran from Liverpool Central to Birkenhead Park and to Rock Ferry, where passengers to points beyond would change. In 1938 the LMS electrified from Birkenhead Park to New Brighton and to West Kirby, and built new trains which ran through to Liverpool. Normally new LMS trains handled the West Kirby route and Mersey Railway trains handled the New Brighton service, as well as the existing Rock Ferry operation. In 1948, on nationalisation of the railways, the Mersey Railway became known as the London Midland Region Mersey section and the old cars were renumbered in the British Railways sequence. In 1956 these trains were life-expired and replaced by further trains built to the LMS 1938 design, the last of the American-designed cars being phased out a year later. The tunnel and railway are still in use today as part of the Wirral Line of the Merseyrail commuter rail network. This page was last edited on 26 March 2018, at 11:37.